These potatoes are amazing. Thinly sliced and seasoned to perfection, the crisp edges mixed with the soft and steamy inside are delicious. These are a must try beside any main dish. Preheat oven to 375 degrees F. Brush bottom and sides of a baking dish or cast iron skillet with olive oil. Using a mandoline or a sharp knife, slice potatoes into desired thickness. 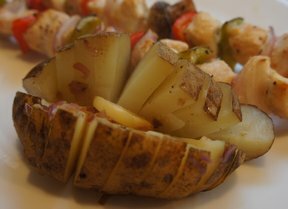 Arrange potato slices vertically and loosely in prepared dish or skillet. 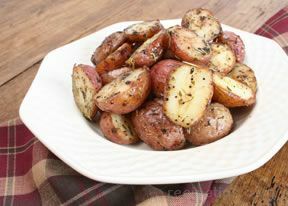 Sprinkle garlic and Italian seasoning on top of potatoes. Season with salt and pepper to taste. Dot potatoes with butter. 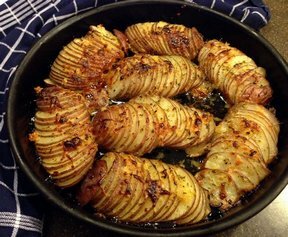 Cover dish with foil and bake for about 1 hour or until potatoes are tender. Remove foil, sprinkle with Parmesan cheese and bake for another 15 minutes or until crisp.